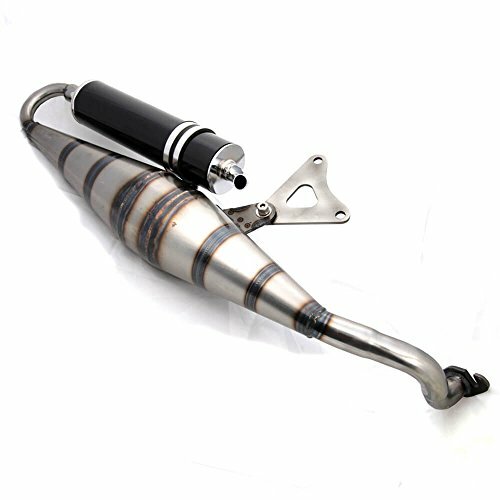 Performance exhaust engineered specifically to maximize the performance of a standard 2-stroke 50cc based scooter. Excellent price point. Nothing on the market gives you the same power at such an amazing price. Don't forget to upjet and modify your air box. We recommend our own Scooterworks Performance Foam Pod Filter, part number 1300-1110. Brand: Prima Fits: Keeway, Eton, Diamo, Baccio, PSF, Vento, TNG, Yamati, Tank, Roketa, and other 2-stroke 50cc scooters with the 1PE40QMB (Jog/Minarelli) engine. It also works on all Yamaha Minarelli Chinese clones using the horizontal engines. If you have any questions about this product by ScootsUSA, contact us by completing and submitting the form below. If you are looking for a specif part number, please include it with your message.